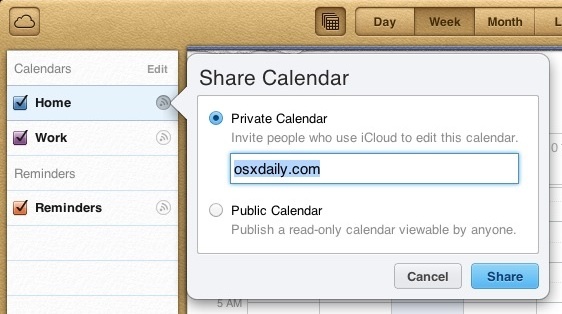 Using iCloud, sharing a Calendar from your iPhone, iPad, or Mac OS X iCal with anyone else is now easier than ever. The recipient can then find the shared calendar in their own iCloud Calendars list, but all parties must be using iOS 5+ and Mac OS X 10.7.2+. You can also choose “Public Calendar” to share the calendar with the world. Great tip discovered by TheGraphicMac. Can’t do it from the iPad or iPhone/iPod touch though. Crazy. Am sharing calendar with ex for sake of kids, is there any way to keep some appointments blocked from his view? Set up different “calendars” and make one for the kids stuff only and then only share that one calendar. I’m doing the same thing for ex. How do I move items already in my calendar into my “new” kid calendar? I was wondering how to do just that! Thanks for posting this. Once you have created the new calendar you must change each appointment and select the new calendar in the appointment.